Perfect for a front or back pocket or any pocket for that matter. Carry the essential cards & cash that you need at a fraction of the weight & bulk. Not only does it reduce the size of the wallet, it helps keep them self with RFID protection. The RFID protection blocks RFID signals used to electronically scan your wallet as someone passes by you. This keeps your drivers license, credit card, and debit card information secure from being scanned and stolen. The inner pocket of the wallet contains the RFID blocking technology. 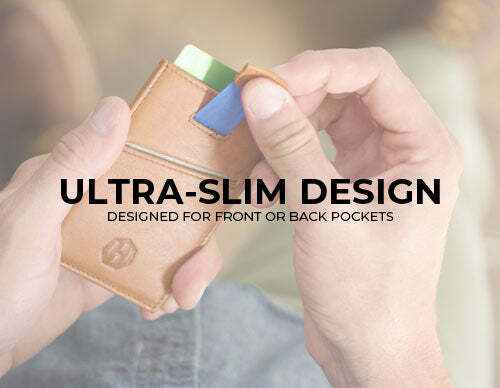 The slide sleeve wallet was designed to be ultra-thin, minimal, and still provide a convenient and functional way to carry up to 8 cards and cash. There are 3 outside pockets to conveniently carry all your wallet necessities, plus an interior wallet which utilizes the slide sleeve design to easily pull out your most used or important cards. All pockets can easily carry cash as well. Is the wallet genuine leather? Yes. The wallet is made from 100% genuine soft and durable leather. With age the slim slide sleeve wallet and leather only gets better and starts to develop a unique patina that molds to your lifestyle. The slide out pull tab pocket allows for quick and easy access to your most used cards. Simply pull on the tab to effortlessly pop out your most used cards. The tab is a durable piece of canvas that sits below the cards and when pulled, the cards come out of the top of the wallet. 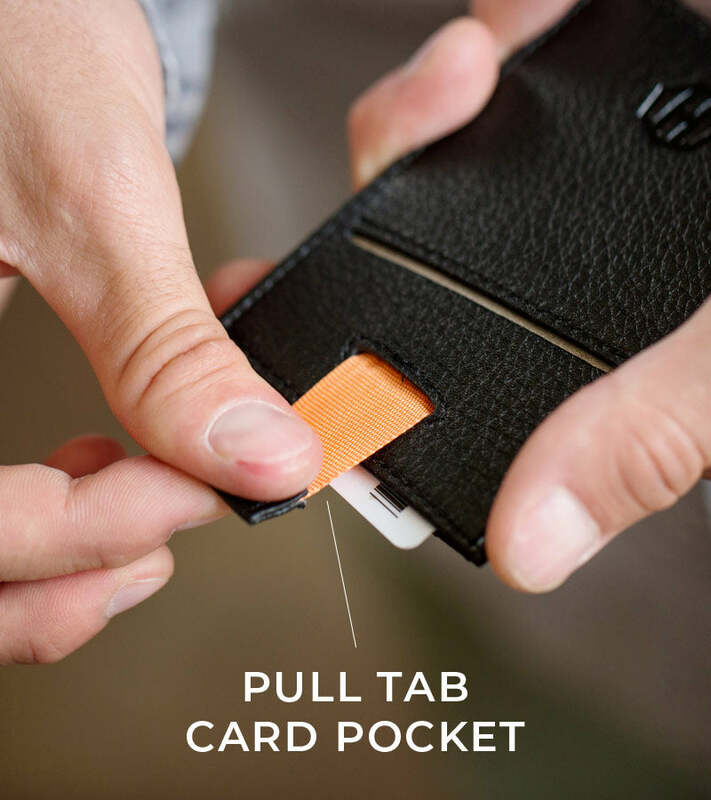 When you are done using your desired card, simply push your card back into the pocket and the tab and canvas get retracted back inside the wallet and ready for the next use.